One of the drawbacks of having a retail store is complaints. Our little shop gets about five a year. Some of them have been vituperative, complete with four-letter words and personal threats. Others have been just plain silly--a person who, after eight months, decided the ebook was defective and wanted to return it. Regardless of the mental state of the customer, in all cases, we replace the item or issue a refund. We want everyone to be satisfied, and if for some reason, it's not within our ability to please, we refund the money and thank the customer for patronizing our store. A few months ago, I bought a $42 circular knitting needle...smiles at the group gasp. The day of the purchase, I had the unpleasant experience of having three sets of circulars needle tips separate from their respective cables as I was working on a top-down sweater. And I was sick and tired of picking up stitches. Thus, I decided to go for the Lamborghini, the Bentley, the ne plus ultra of knitting needles--a Signature. When it arrived, I reverently unwrapped it...to discover a slight burr on the tip. Oh well. It took five gentle swipes with 800-grit sandpaper to smooth the burr. I was in the middle of the sleeves at that point, so I put the needle aside until I was back at the underarms. I knit four inches of sweater...and then...one of the needle tips disengaged from the cable. I was flabbergasted. I purchased this needle on November 29, 2012, invoice #xxxx, Paypal Unique Transaction ID #xxxx. It arrived with a burr on the tip. You can see where I sanded it off. I knit four inches of a sweater with this needle. This morning, one of the tips separated from the cable and rolled underneath the refrigerator. I am not moving the refrigerator to find it. I am an old woman with a bad back. Notice that if you run your finger up the remaining join from the cable to the needle, there is a sharp edge on the metal. I was wondering why I was seeing frayed yarn bits as I was knitting. As I paid $42 for this needle, it never occurred to me that the join was responsible. Instead, I was blaming the yarn vendor for the fact that I kept having to unknit areas and join in new yarn. Silly me. I expect you to replace this needle with one that actually works as advertised. That is, the joins remained joined and doesn't shred the yarn. Thank you for your note. You stated you received your order in November 2012 and at that time you noticed a burr on the needle however you did not contact us regarding the burr. Our warranty/guarantee policy states you have 21-days from the day you receive your order to contact us regarding any manufacturing flaw or defect. You also stated that you sanded the tip of your needle. As stated in our warranty/guarantee policy: "The warranty is void if any changes, modifications, or additions are made to the needles after purchase." I have included a link from our website detailing our warranty/guarantee policy. Unfortunately by sanding the tip of your needle you voided that warranty/guarantee. I am sorry but at this time we cannot replace your needle. Now, I don't know about you, but I infinitely prefer the treatment I've received from KnitPicks when their needle tips go walkabout. They replace them. No fuss, no muss, at least for the four that I have called them about. And I give you three guesses as to which needles I will be purchasing in the future. And which company I will never again patronize nor recommend. ETA: Less than an hour after this blog post appeared, this email dropped into my mailbox. Yay Internet! I have consulted with our quality control department. They would like to inspect your needle for any manufacturing flaws or defects regarding the rough join/separation issue you encountered with your needle. I have attached a return merchandise authorization form for you to complete and include with your needle. Please use RMA# XXXXXXXXX. 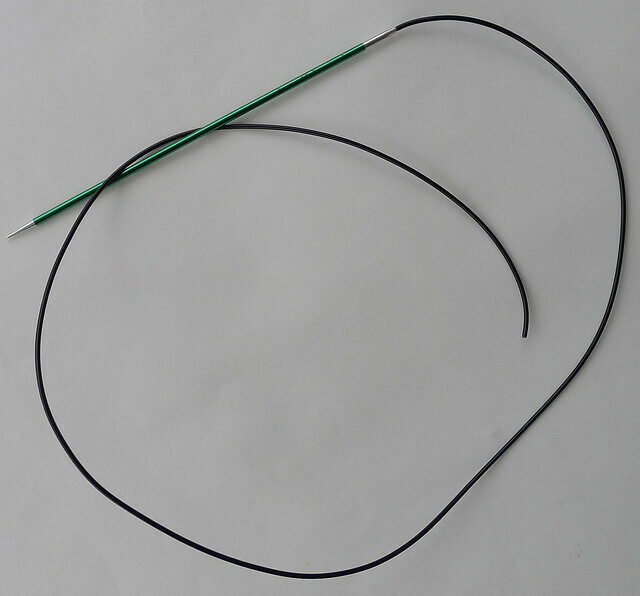 Which needle from your Nov. 2012 order did the cable separate from; the size 01-5"-32" or size 03-4"-20"? Please tell me which size needle separated and I will send you a replacement needle. I wanted to thank you for contacting us this weekend and let you know I have come across your blog post this afternoon and reviewed the customer service practices on how your email was handled. We strive for 100% customer satisfaction and I am never happy to see that a customer does not receive the highest quality attention to their concerns. I see that the information and policy was sent based on the burr being sanded, but as you have addressed in your blog this should not have mattered. The breaking of the cable from the needle is 100% a manufacturing defect and per our normal policy, you should have been asked for a photo of the needle and a replacement should have been sent out immediately this afternoon no questions asked. Again I do apologize that your inquiry was handled in this manner and that you did not receive the level of customer service that we strive for. We aim to produce the highest quality products as well as always provide our customers with service to match. Please let me know if you have additional questions or concerns and again I apologize for the reply you received.